There were many breathless reports about today’s release of employment data for June, including this bit of coverage from Forbes. The report was better than expected in many ways: the number of jobs created was fairly strong; there were positive revisions to prior months; the official unemployment rate fell, as did the total “U-6” unemployment rate, which includes the unemployed plus potential workers “marginally attached” to job search and those employed part-time for economic reasons; labor force participation held steady, which must be viewed positively given recent trends. The report seemed to reinforce impressions that the economy is gaining momentum, a welcome relief after the decline in real GDP in the first quarter. Some referred to June as a possible “inflection point,” but that obviously remains to be seen. Labor market conditions have been less than robust, the unemployment rate is still high for this stage of an economic expansion, and there are still far too many long-term unemployed and discouraged workers. In addition, very little attention was paid by the media and most economists to a disturbing pattern in the jobs created in June: While total employment increased, there were 523,000 fewer full-time jobs (seasonally adjusted), while part-time employment increased 799,000. ZeroHedge has a brief discussion with a few charts. This undermines the case for real strength. There are fears that more full-time workers will be reduced to part-time status as the (delayed) Obamacare employer mandate takes hold in 2015. 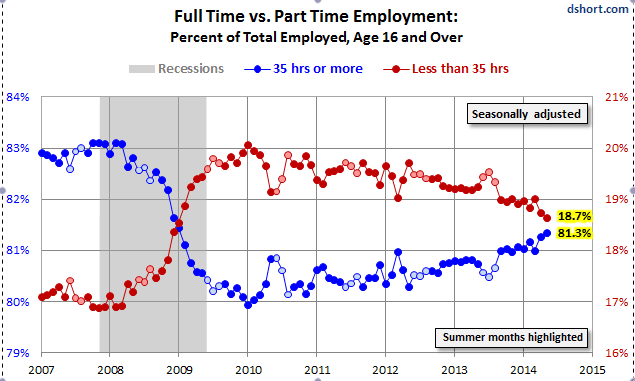 The chart above does not include the data for June: 80.8% full-time and 19.2% part-time, so the gap widened.